Keep your paws dry. Mr. Bowie, here’s a reality check: if you are out there in wet conditions—which could entail heavy rain showers, dew-soaked grass or melting snow—your paws are going to get wet. So-called “waterproof” paw-wear will not keep your paws dry. Don’t believe advertisements that make such claims. They are false. Bowie je bent een echte super slimme poes! Mwahaha….the look in his face is priceless. Yeah;) And probably also: ‘Oy, pick me up already and carry me inside’. Looks like time to come in Mr Bowie. Poor kitty. But smart enough to find the only dry spot in the garden. So cool that you can see his reflection on the wet pavement. Cats are so patient sometimes I think maybe he could wait so long that all the rain would dry up. Sleep mode? LOL 😉 and of course Bowies situated in the one spot that is dry. BTW…I am totally in love with your garden. I love the symmetry and mixed media of the design…beautiful…very inspirational, actually. Mr. Bowie, you’re going to be sitting there for a while. I guess you never expected that much rain when you went under that table. MaChatte will go out when it’s wet and even lay down and roll around in the wet grass. But as soon as a few drops actually fall on her, she’s ready to go in. Each has their own personality. We love ’em! Ha! I think Mr. Bowie wanted you to put down the camera and come rescue him. One of my favorite shots. Mr. Bowie must have been sitting there for a while since the water is so still. Hi Geraldine, welcome on HoB. Thank you for following. Much appreciated! How long did Mr Bowie wait there to collect the puddle around the dry patch? That is a classic piece of feline thinking. I love it. Poor Mr. Bowie! At least he stayed dry. Right? he he he Poor Mr. Bowie! I agree that it does look like Mr. Bowie was giving you the “rescue me” eye in that shot! Glad you complied with his wishes…..otherwise there would have been some heavy pouting going on I think. You know he blames you Herman, even though you probably called him to hurry in…LOL, what a face! 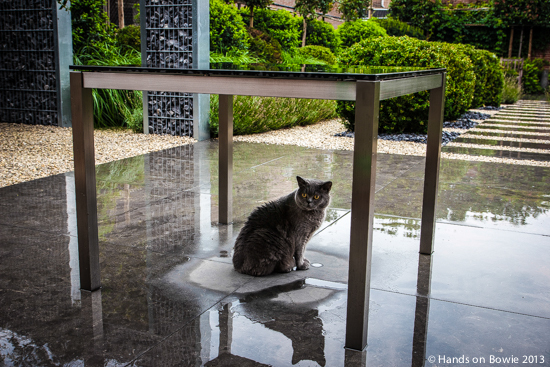 NO MAN IS AN ISLAND…BUT A CAT UNDER A TABLE IN WIND-BLOWN RAIN SURE BECOMES ONE!!!! The very picture of Extreme Cat Stress (note the razorback and the annoyed look). Every time I look at this photo, I smile! It goes without saying, this is definitely a Mr. Cheddar approved reblog. Thanks to Hands on Bowie, one of mine and Chedsters new fav blogs. for a very brief moment I thought Mrs. Bowie poses like an owl, nonchalant and focus. Oh my! Poor Mr. Bowie. One small dry spot. Amazing photos, so crisp and clean and capturing so much personality! Hi Rob. Welcome on HoB! Thank you for your nice comment and following HoB. Much appreciated! Great shot! Love your cat – he looks like a real character! Thank you, Jeanne! Welcome on HoB. Thanks for visiting and following. Much appreciated!